buy Keppra look at these guys Do you ever feel like you have so many beauty products that you don’t have the time or money for another product? However, what if I told you there was a product on the market today that would make the rest of your makeup look better and last longer? Well that is exactly the job of primer. Let’s break it down. There are two main primer ingredients: water based or silicone based. Some popular silicone based primers are the Photo Finish Foundation Primer from Smashbox or The POREfessional Face Primer from Benefit. They are meant to help control oil and also make pores look smaller since they can be “pore-filling”. Silicone primers tend to be more mattifying. 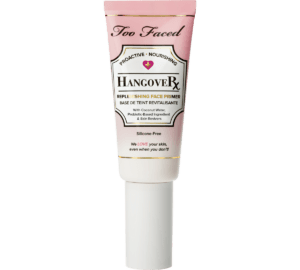 Hangover Replenishing Face Primer from Too Faced or Illuminating Primer from Cover FX are for drier skin types to help hydrate the skin. Added benefit from water based primers is the illuminating glow they add to the skin. Think of primers as double sided tape. One side is addressing skin issues and the other side addresses holding the makeup on. A good primer will help balance the skin condition to create a better canvas for the foundation. Most foundations will emphasize any texture on the skin whether that is large pores or dry, flaky skin. 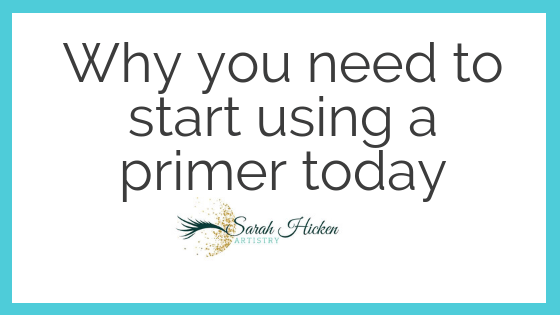 The primer will help “correct” and smooth the issue out. However, even the best primer and best foundation can’t cover an incorrect or unused skincare routine. Primers create a “shield” between the skin and foundation. Some primers like The Silk Canvas Protective Primer from Tatcha was created specifically for that reason. It will help protect the skin from foundation which could cause congestion/acne. Different primers will also have UV protection. It is essential to always use SPF daily to protect the skin. Don’t strictly rely on the primer to adequately protect. Primers once applied might feel a little sticky on the skin. Primer will hold the foundation and other products onto the skin while targeting the skin issue like blocking oil from breaking through and ruining the foundation. Primers do need to have time to soak into the skin especially if they are oil based. Did you know there is more than just face primer? There is eyeshadow primer, lip primer, and lash primer: all with the same goals in mind. Eyeshadow primer should always be used. It will fix almost any problem you might have with eyeshadow. Is your eyeshadow moving? Is the pigment just not showing up? Is your eyeshadow disappearing? Then invest in a good eyeshadow primer. One of my favorites is the Urban Decay Eyeshadow Primer Potion in Original. I did a trial to see how long my eyeshadow would last. It lasted over three days! I have had clients who have worn their makeup two plus days! A quick trick is to lightly set the eyeshadow primer with your setting powder. It will still hold the eyeshadow but make blending the product a lot easier! Lipstick can be a tricky product to work with. I personally hate when it gets on my teeth or doesn’t last! During the day, all the drinking, eating, and talking we do becomes enemies of our lipstick! A lip primer will increase the longevity of your lipstick. It will also help it look smoother and prevent it from settling into lip lines or smudging easily!! Lash primer will help create more volume and help your mascara last longer. Did you know that some lash primers even have conditioning ingredients to help your lashes stay strong? My foundation is sliding around after I apply my primer. What is wrong? Well it might be a couple of things. You might be using too much primer! You only need about the size of a pea for your whole face! It might also be the ingredients. Oil primers aren’t going to mix well with water based foundations. If you still want to use the oil primer, it will need 10-15 minutes to soak in enough that it won’t affect the foundation. As I’m applying my primer, it starts to ball up and just rub off my skin the more I try to blend it in. What is wrong with my primer? I would start with looking at your application process. Silicone based primers need to be pressed in. If you rub, it is breaking down the bond and causing it to “ball up”. I would also make sure that you are exfoliating, 2-3 times a week depending on your skin type, to make sure the primer is going into the skin; not staying on the surface and rubbing off with dead skin. Why is my foundation still breaking up on my face even though I’m using an expensive primer? I like to describe makeup as a trial and error process. You have to find the right primer for your skin. The price doesn’t make a product perfect. I would recommend using the same primer with a different foundation, because it could be the foundation that isn’t lasting on your skin. Make sure the primer is targeting your skin type. A hydrating primer isn’t going to do anything to help control oil. I do offer personalize makeup consultations so we can talk about your skin type and find the best products for you! Listed below are some of my favorite primers that I use! Hourglass – Veil Mineral Primer – This is one of my favorites because it’s ideal for all skin types, even sensitive skin. It has SPF 15 and it repels water so you will see a longer makeup wear time. Becca – Backlight Priming Filter Face Primer – This primer is like wearing a Snapchat filter and helps add radiance to skin for the appearance of healthy glowing skin. The ingredients are what make me love this primer. It has three types of crushed pearls and Vitamin E to help hydrate and heal the skin. Too Faced – Primed & Peachy Cooling Matte Perfecting Primer – I love this primer for a couple of different reasons. First of all, it smells delicious! It has a matte but blurring formula so it will help give the skin a smooth feel while the cooling application helps the skin not feel dry! This is a primer that needs to be pressed in! If you have any questions about my services, please head over to the Contact page. And let me know what your must have beauty product is in the comment section!